When you hear the word concierge, thoughts of luxurious destinations and impeccable service come to mind. And if they have anything to do with it, Target will be joining that list of initial mental images so long as their new experiment works. 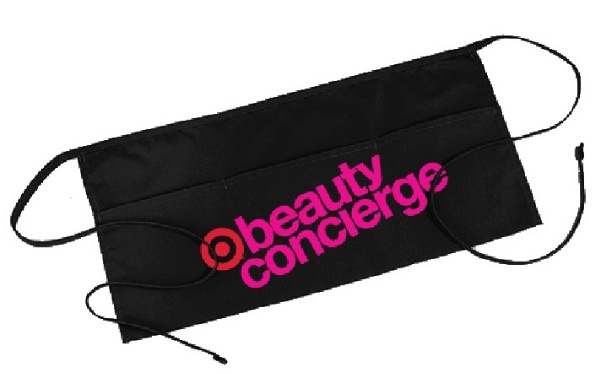 On July 15th, the retailer launched a pilot beauty adviser program, called The Target Beauty Concierge in 28 Chicagoland area stores. The program is designed to enhance the in-store beauty experience for in-the-know shoppers who want and expect comprehensive service and product education when shopping beauty. These shoppers are consuming an increasing amount of beauty news on a daily basis, from traditional print magazines to beauty bloggers and vloggers. So the Concierge program will serve as another layer of support and educational reinforcement, especially as Target looks to offer more specialty/prestige brands that require deeper product knowledge. Speaking of a makeover, the Beauty Concierges are departing from Target’s standard red and khaki uniforms, and will be sporting A.B.E. or all black everything, while wearing aprons that clearly identify them as members of the program. Concierges will also be equipped with custom nametags, a mirror, a product sample box and the aforementioned ipad. While its too early to tell whether or not this experiment will be a home run for Target, it is an interesting investment in a beauty department that’s been subtly expanding for years. And if they decide to introduce the program in all of their stores, it’ll be yet another reason (or excuse, depending on who you ask) why we just can’t seem to shop Target for one item only.